My husband and I drove to the Ikea restaurant for lunch, as I had a buy-one-get-one-free Chinook Book coupon. The two of us indulged in salmon plates for an out of pocket total of $6.99! (There’s no tipping.) We also enjoyed steaming hot cups of joe, as coffee and tea are free with an Ikea Family card. We then walked downstairs where I redeemed a coupon for a free Frakta bag. By the way, those Flürben Fnöpprüft Frakta bags are perfect for transporting bedding and other soft gear when moving kids into their dorms. Cannot stress this enough! Of course, I found a penny on the ground. We then zipped over to nearby Costco where we topped off the Prius with cheap gasoline. I’m selling a pair of sunglasses that I picked up from an Ashland free pile. 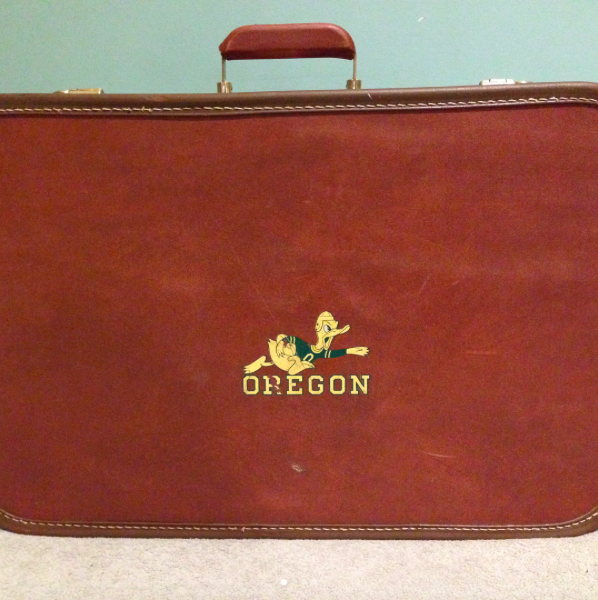 I also listed a thrifted vintage suitcase on Facebook Marketplace and a couple items on eBay last night. I’d changed my mind about converting a big stereo speaker into my son’s bedside table, and convinced my husband to help me haul it to the curb as it weighed an actual metric ton. It was still out there flapping its “free” sign when we went to bed, but was blissfully absent by morning. I wrote up and submitted another Clark Howard article, which felt good as I found it hard to focus this summer with the kids around. Getting back to paid writing will help to pay our mortgage, the additional rent on two apartments, as well as making sure we have enough money socked away for the next tuition payments come January. Of course, I’ll also be working my shifts as a labor and delivery nurse. My husband and I have plans to take in a movie tonight at a local second run theater that features 2-for-1 Tuesday night admission. When tickets are two bucks apiece I’m not so picky about what film I’ll be seeing. Car chase dum-dum movie? Whatever. (1) Katy, that suitcase is irresistible, and I’m not even an Oregonian! Should sell fast. (3) We’re doing our best to placate Mother Earth here on our own quarter-acre by continuing to harvest vegetables and herbs hand over fist, and by clearing out spent plants and spreading compost as patches of the garden are vacated. (5) I’ve been run too ragged recently to go thrift shopping, so I suppose this counts as a Frugal Thing. I have every intention of backsliding once I get a free few hours, however! A. Marie: we spent our summer vacation in the Finger Lakes, it’s such a lovely area and worth the drive to the US. Okay, I have never heard that about the nasturtium seeds…what a fantastic idea! I didn’t grow any this year but I will definitely keep that in mind. It’s so great to see you and your husband enjoying your empty nest! My husband and I already dream of a quiet, empty nest one day. But our youngest is only twenty two months, so we still have plenty of years to get used to having them around without diapers and tantrums. 1) As usual on Sunday afternoon we did a budget check in, meal planned, and grocery shopped at Aldi. 2) I renewed library books to keep from having fines. 3) We shuffled the vehicles to make sure we minimized time on the road in the gas guzzler while still getting all family members where they needed to be. 4) My husband and I went to our annual physical. It is free under our insurance. Plus we’re hoping an ounce of prevention is worth a pound of cure. The doctor told us that we were doing great. 5) Last Saturday my husband and I enjoyed a kayak trip that my mom paid for as a birthday present for my husband, during which she also watched the kids. Yes, she is amazing. This weekend we are planning to use a gift certificate to a local restaurant that was a gift from my mother in law that also includes babysitting. She is also amazing. Experiences with my husband during which we get a break from the kids? Best presents ever. 1. Went to Aldi’s and came out with four bags of groceries for $32. 2. Used by debit rewards card to pay for the groceries, card expires October 1st so trying to use it before I lose it for things we need. 3. Made flavored coffee at home during my lunch break and brought it back to work – Chocolate Rasphberry Torte, yum! This way I didn’t buy a pop from the work vending machines for the caffeine to keep me a wake. 4. Closed all the blinds before leaving home as the air is on. We have had record breaking high tempatures not normal for Michigan causing schools to close due to the lack of air conditioning in the schools – Unfortunately my district didn’t close. Frugal fail is electric bill will be high for air conditioning instead of gas bill for heat. 5. Booked one of my daughters follow-up orthondic appointments on a unpaid day off, the other will have to use a half a sick day, hate to use those, like money in the bank. Good news is top braces come off in November, light at the end of the tunnel and payments which end in December! Woo hoo! 6. Submitted invoice for two pet visits from this weekend bringing in extra cash. 1) Read Dave Ramsey’s Total Money Makeover (checked out from the library). I had not previously read any of his material or listened to his radio show. His personal finance empire is so ubiquitous, and I was curious why he is so popular. I did enjoy the book. I need to keep my motivation level high to save as much as possible this year, and reading books like this helps in that respect. 2) Cancelled a gym membership. I have used and enjoyed this gym in the past, but have not been going frequently enough over the past 6 months to justify the cost. I will try to get outside for longer walks and generally keep more active in day to day activities. We may join again at a later time, but for this year it’s out of the budget. 3) Instead of ordering takeout, I cooked a quick, simple meal for Saturday night dinner with ingredients already in the refrigerator – omelettes filled with a little leftover smoked salmon (a treat from a recent Costco visit) and a green salad with a homemade dressing. Husband was grumbly at first, but conceded it was a really great meal. 4) Spent almost an entire day stuck at home in vain waiting for the Comcast technician to come and alter our internet/cable tv connections. I am in the process of switching to a different and much cheaper plan that requires different equipment. My appointment had somehow been “cancelled” for unknown reasons. Grrr. Here’s where condiments are such a great complement to a frugal menu. Throw in a dozen capers with that omelette to kick it up a notch in specialness! 1. The incredible warm and sunny weather has allowed us not to have the heat on, or use any wood for the inside fireplace. While we had almost no summer to speak of in the traditional summer months (way too many days with highs in the 50’s and 60’s to count), September has finally brought summer to Wisconsin’s north woods. Since September snow isn’t out of the question up here, this warmth is much appreciated and is keeping my heating bill non-existent for the month. We don’t have air conditioning, so no worries about additional electric usage from last week’s heat and humidity. 2. The cherry tomato plants are loving the warmth and sunshine too, and are still giving me several dozen – or more – sweet little tomatoes each day. 3. I’d had a term life insurance policy that was relatively cheap, but was slated for a big increase on renewal due to my…age. I chose to cancel it rather than renew it. Our home is paid for, our last college tuition payment for our son was 15 years ago, and we have more than sufficient paid up life insurance without it. 4. Used a $1 off coupon for gasoline. 5. Found a penny – the first coin I’ve found in a long time. Why do you always say ‘the Prius’ instead of our car or our vehicle. Is this a status symbol? No one I know refers to their van as ‘the minivan’. As opposed to what – a ‘maxi van’. I have a van and we call it the van as in: should we take the car or the van? Lol Katy! I have many friends with lots of kids (like eight plus)…LDS here…and more than one of my friends has a full size van and also a mini van, so I am used to folks referring to “big van”, or the “mini”. Also, on frugal websites, many folks refer to their Prius (which I have never known that to be a status symbol to anyone), Honda Accord, the new all electric cars, hybrids, etc. because different vehicles refer to different aspects of frugality. I refer to my vehicles as the Toyota Yaris, or the Ford Focus, …and neither one of them are known for being status symbols either. I just do not “get” the comment about the Prius being referred to as a status symbol…I would understand if it were referred to as a frugality symbol….a Mercedes as a status symbol, yes…but a Prius????? Maybe they are referring to the “Toyanda Pious” in the Southpark episode “Smug Alert” ? Love our Yaris. Rented one for 10000 miles and loved it so much we bought one. Love the gas mileage. We are retired and travel A LOT. I don’t think Baker was trying to be snarky. To me, when Katy says “the Prius” it seems to be because it’s a hybrid, so it’s more efficient to drive, especially on long trips. But it does would be kind of awkward is she always referred to it as “the hybrid vehicle” or “the hybrid sedan.” We have two vehicles, a 2001 Subaru Outback (the station wagon style) and a ten-year-old hybrid Toyota Camry. For some reason, we refer to the Subaru by make, but the Camry by model. Holy typos Batman! That should read “But it would be kind of awkward if…” Oy. I thought the use of a Prius was a frugal decision because it’s more fuel efficient than most cars. No? Neither of our cars could be considered status symbols either. And yes, Prius’ can be more frugal. So why not call that out and make it a frugal thing? I have a 2009 hybrid Highlander that I love (bought used), & hubby has a 2014 Ford Mustang (also bought used). We generally refer to taking “my car” or “your car”, though there’s no real specific ownership (my hubby might argue that point, the Mustang being his midlife crisis). My car is the Nox. His is the pretty red truck. We also have the Blazer and the Beast but they pretty much stay parked except for around the farm stuff. We never say our car or our vehicle. Unfortunately, my husband has a car collecting hobby so we refer to vehicles by their make. The Camry, the Jeep, the Volt..etc. Also, some people have full sized vans so that could need to be indentufied, too. I would think referring to a Prius on a frugal website would just be another plug for frugality. Also, I kinda like that Katy mentions more specific details because it gives me more of a mental picture of the things she is writing about. Specifics make the information more interesting, don’t they? Does having a Prius imply higher status? I must be missing something. As I recall, Katy, you bought the Prius used. We just bought a Kia Niro hybrid and love it. I am also loving the fact that my husband is really getting into competitive fuel economy driving. No more fast acceleration, speeding up to red lights, and passing people. We had our Honda Civic (which I tried to sell to you!) for 20 years, so that was pretty frugal. Yeah, it’s ten years old now. Hardly a status symbol. Car Chase Dum-Dum movie. You crack me up! For $2 a pop you could even NAP during the movie. I swear by the IKEA bags for moving kids into dorms also. We left our daughters dorm with a very manageable bag full of bags. 1. The vacuum hose for our pool broke today so I was unable to fulfill my vacuum duties ( I know so sad). My husband came home and cobbled it back together with some screws. It should work. 2. Went to my dentist appt this morning which is covered by insurance. I left with my free toothbrush and a clean bill of health. 3. Picked up some groceries at Meijer on my way home. I used a coupon for a free diet coke 12 pack. I also clipped some mperks coupons which gave me another $4 off my total. I paid using a gift card I’d purchased with a $5 off coupon. 4. Also went to Aldis. I picked up only the items on my list and used a $5 off coupon my mother gave me. I bought a half gallon of milk which was .69 (gallons were 1.04 but we don’t drink that much) and three dozen eggs which were .34 a dozen. 5. Cleared out the few sodas which were left in our pool shed refridgerator and turned it off until next season. I turned off the air conditioner, the ceiling fan and put my dishwasher on a 4 hr delay in order to keep my electric use down for the 2PM-6PM energy savings day critical peak time. Electricity is 6 times more during this time. Thanks. That’s a great idea. I took my little girl to the zoo and took advantage of my work paid trimet pass to ride the MAX. I didn’t have to pay for parking and it was a fun adventure for my 2yr old. 4) printed off coupons for my gluten free products I buy (I have a gluten allergy so when I can save I do!) I was able to get 5 coupons for 5 products totaling 4.00 in savings I will get. 5) Wrote out our Budget for October, have the non-grocery shopping list made up, have the grocery shopping list made up. *Bonus* I made my own Advent Calendar that is reusable year after year, I made it with my computer and printed it up. It has the bible verses referenced, along with RAK’s( Random Act of Kindness) added to each week, and reminders for the Christmas season. 1. Have been eating out of the freezer so we have some room for moose meat. I believe we are down to the seventh circle of hell, where freezer burned foods reside. Found two lobster tails that had been sent to me as part of a birthday gift in October 2016. (HOW could I have forgotten them?!) Made a lobster bisque that hid that freezer-burned on the edges taste and we enjoyed it for two nights. 2. Due to eating out of the freezer, spent nothing on food this week or last until I went in to buy flour this morning. 3. Found a coupon on the floor of grocery store that gave me a dozen eggs for 40 cents. 4. Made four loaves of bread, to supply us for the month of October. Making them all at once saved on reheating the oven three more times. 5. Needed to bring cookies to a gathering. Found a can of condensed milk and had shredded coconut so made the two ingredient macaroons from the Rachel Ray TV website. Lol, I think that was me! It’s amazing so similar looking frozen foods can be. Always an adventure in defrosting. We too were “eating out of the freezer” like crazy to make room for the incoming meat–but I think this would be a lot less of a chore if I’d found lobster at the bottom! And making room for moose meat intrigues me. I’m fond of venison when I can get it; how does moose compare? I’ve only had venison once but moose is more gamy tasting, as is caribou. To my taste buds, reindeer meat is the closest to venison. It also depends on how you cook it; some recipes mask the gamy flavor better. The meat I hate is bear. Maybe I don’t cook it enough but the two seasons we got a bear I dreaded bear meat meals because the flavor was so strong—very fishy if you catch it when they have been feasting mostly on fish. We were thankful for the meat, especially since these were low income years with debts from graduate school haunting both of us, but the second year I had all the meat turned into burger or strongly spiced sausage and we ate it as chili because that masked the meat’s taste. After that I think we didn’t eat chili for a few years, we were so sick of having it three or four days of every week. And we only had reindeer for one year because the kids balked at eating Santa’s helpers. Funny that Alaskan bear tastes like fish. When I think about it, it makes sense since salmon is such a major part of the bear’s diet. This validates a recent observation that I had myself. The last shipment of grass-fed beef that I bought tasted like a meadow. I really had to season it well. 5. Thanks for the macaroon idea. I’m gonna try that one. I have those ingredients. 1. Made delicious chard, sweet potato and chicken italian sausage soup with ingredients on hand. 2. Dried clothes in the sun yesterday. 3. My solar panels have been turned on. So excited about this! 1. I had an important meeting today so I pulled out a thrifted dress and sweater combo with matching shoes. 3. I came back to the office for rice and beans for lunch. 4. Last night I made a curry with fresh spinach from my garden, so dinner is sorted when I get home tonight. 5. Free entertainment listening to a Buffy the Vampire Slayer podcast that has me in stitches. 1. Sold 3 items on Amazon in past 2 days. 2. Took 2 bags of books to used bookstore today. Got $17 credit. Used it for a few cookbooks and a book for DH’s birthday. 3. Found silver Mercury dime today sitting on Coinstar machine. 4. Used a $5 coupon at Aldis that a woman in line gave me. 5. Picked up 3 bottles of contact lenses solution from a fellow freecycler. 1. I’ve done some walking to places this week, that saves on gas and gives me a little exercise. 2. I’ve been paying better attention to prices, and so far it’s confirming what I suspected that the market and corner stores are cheaper than the grocery stores. Extra bonus, they’re closer saving on gas. 3. We’re already looking into plane tickets for next year, and found some good ones. If they’re still at that low price when we get our next paycheck, we’ll probably purchase them. 4. I pulled out a chocolate cake mix that had been sitting in the cupboard forever. We mixed it with peanut butter, honey and sugar. Then we rolled them into balls and rolled them in sprinkles. It made for a yummy, bake-free treat! 5. I cut open an almost empty tube of toothpaste and got a few more uses out of it. I did the same with a tube of mouse and got 1 more use. 1) Received 4 flats of peaches from one fantastic neighbor. His trees are overloaded and he can’t keep up with all of them. I spent yesterday afternoon peeling and chopping and made 8 pints of salsa, froze a whole bunch for smoothies, and baked a cobbler. Today I’m picking up garlic to make peach bbq sauce (and I’ll STILL have more for snacking). 2) Eating lots of garden deliciousness. It was near 90 yesterday (In Maine, at the end of September…weird) so my kale is looking a little worse for wear but I’m hoping a cooler temps will perk it up. 3) Have been going through the house, garage, etc to put things up on Craigslist this weekend. We want to sell our place and move around spring so we figure the more crap we get out (and money we bring in) the easier the move will go. 4) Received my payment for a 20/20 panel I did a few weeks ago. Easy 145$!! 5) Doing lots of mturk to make Christmas as free as possible. Between money from that, and my paypal $ from pinecone research studies, ibotta, cash back sites and the like…my Christmas budget envelope will hardly get touched. Woop! Stacie M, may i ask – what is a 20/20 panel? 1. Made leftover soup with all of the leftover bits of veggies I’d kept in the freezer. Used 1/2 price beef bits and some barley I already had. 2. Birthday yesterday, hubs insisted on taking me out, so I decided on lunch instead of dinner and no drinks. 3. Neighbor gave me tickets to a local event with food and music in exchange for pet sitting. 4. Froze 1/2 of the bday cake a friend baked for me. Will save for when we have company. I would have frozen more, but when I got home from work, 1/2 had been eaten by a hungry DH! 5. Still harvesting tomatoes, little cherry ones. Pulled off most of the green ones before the storm hit and letting them ripen in the window. 3. DS wanted a healthier bread that he could eat his sandwiches on. went to the freihofer outlet and found a good option for .89….their usual price for all their bread including arnold, thomas’ and sara lee. 4. went to the small indian market and bought all this for 3.48. scallion bunch, peppers (2), jalapenos (3), celery bunch, good size knob of ginger, onion, 3 pickling cukes and something else. 5. hung a large load of towels on the line yesterday. I kept planting my face in the towels while i was folding. seriously. I looked like i was huffing them. line drying just makes everything smell so good. I apologize if someone else has asked this before…but are your costs lower now with both of your kids living off-campus? Hoping so! I’m assuming they are. If you live in the dorms you are required to be on a meal plan. My daughters meal plan for state university is $3000 a semester. Unbelievable. She barely eats. I think she’ll be able to live in a shared apartment next year for less then the cost of one semester in the dorms. I told him that adult tickets for the museum were $17 each and that $34 is an expensive family day. I suggested we go bum around Ikea instead. Lunch there would be cheaper than museum tickets, their cafeteria has a kid’s play area, and the toy section is also great for kids/parents to walk through. We’ll see if he goes for it, lol! The museum is a learning experience though. And IKEA just…isn’t. Maybe there’s something else that is in between expense-wise. Local park and a picnic? 1. Find our political contribution receipts. In MN they will be reimbursed up to $100 per couple – but you must mail them in order to get the rebate. DH says he has them . 2. DH thought he lost all his vitamins and meds while we were travelling over the weekend. Found them in the trunk of our car – purchased unopened bottle of vitamins from Costco – hope they will take them back! 3. Dog went to Pet Hotel for weekend – charged me for a nail trim that didn’t happen. Need to call them and either get the service or a refund. 4. Have a $10 coupon off $10 at Penneys – also have a new nephew who needs a baby present. Good place to use this windfall. 5. Regularly check in with my favorite thrift store but also need to “window shop” Goodwill and a by-the-pound place near here. 1. Had 14 family members for a BBQ for DD’s birthday. Burgers, corn, potato salad and cake, all delicious, and not expensive to make. Much cheaper than Indian takeaway, which I did consider. 2. Put in a claim from medical insurance for massages, $95 a pop. Had the money in my account within 3 days. 3. Taking dog for nail trim, for only $5 provided you do it once every month. Otherwise it’s $10 per time. 4. Walked to both the library and the pharmacy for exercise and errands. No parking to pay for. Frugal fail: purchased a new dishwasher for rental house, as it wasn’t draining and DH couldn’t locate the problem. The fellow who delivered it went to install it, and said the old one was fine, he had found a clog in the pipes under the sink which was the problem. We had paid for the dishwasher , plus delivery and installation, so may not be able to return it for all we paid. Kept the old one, the new one is sitting in my garage for now. 1) Got a free flu shot at work. 2) Happily accepted a bag of coffee beans Middle Daughter had planned to take to school before realizing she needed grounds. Waaay out of date (she’s been packing for months), but we’re using them anyway. The coffee tastes fine. 3) Came home Monday as planned, even though Middle Daughter is still having trouble with the housing office, rather than paying for another night at the hotel. It’s frustrating not to be there to help, but I think it’s probably good for her in the long run to deal with this without her mother hanging over her shoulder, and hotels are VERY expensive in that city so it’s certainly good for my budget. 4) Finally bit the bullet and listed the rental house for sale. We will miss the monthly income, but spreadsheets don’t lie: we can’t move from this relatively inexpensive area to the very expensive city where my hubs’ new job is without selling both our primary and rental homes. Frugal because it is likely to sell much faster than the primary home, which will help us relocate faster. Living in two cities is crazily expensive. And also frugal because reality, no matter how painful, is better than fantasy when it comes to budgets. 5) All kids but one were together this weekend. Kid who had to work has a birthday coming up. His siblings plotted together to recycle something one of them already owns into a gift he really wants with just a little money out of pocket to customize it for him. Frugal for them, will be exciting for him, and lots of free entertainment for me to hear them plan it. 1) Eating the leftovers from dinner last night that no one else in my family enjoyed (Moroccan couscous). I’ll be eating it for lunches the rest of the week, but luckily I think it’s delicious, so I don’t mind at all! 2) Called and switched our car insurance today saving us $500 for a 6-month period. That’s crazy! And why it always pays to shop around every time your policy is up for renewal. 4) Had oatmeal raspberry bread for breakfast that I made in the crockpot this past weekend. We’d had an oven fire and had to use the fire extinguisher, which left the oven out of commission until I could get all the melted plastic and fire retardant cleaned out (it was my fault…guess I should not be so upset about #3…lol). All of my baking plans went out the window, but instead of wasting the raspberries I had intended for pancake cake, I found a recipe I could cook in the crockpot instead. Love having breakfasts done for the week! 5) Groupon had a $10 off promo code today, so I used it to get a $25 voucher to a local pizza place for only $5. We will have guests with us over the holidays, and we always end up ordering from here at least once when they stay with us, so this will come in handy in a few months. 1) Life with 2 teenagers is expensive right now. I just keep telling myself, “It could feel so much more expensive if I wasn’t making some frugal choices.”. 2) I brought my lunch to work for the milliondieth time. This one is almost on autopilot, as I work on a large medical campus with remote parking, so “going out” for lunch is hardly even an option. 3) Listening to free Pandora at my desk. 4) I have been meal planning for about 2 months now and am noticing that knowing what I’m going to make reduces the “what’s for dinner panic” which usually ends in picking up takeout. I’m pleased to have learned this about myself! I never thought I needed to meal plan, but turns out, it is a really effective strategy. 5) Dropped my high school senior off at a conference today. She had to dress professionally. Each item she wore (beautiful dress slacks, blouse, and heels) was thrifted. She is her mom’s daughter! It’s nice to see frugal lessons pass on and stick with our kids. “Car chase dum-dum movie?” Bahahahahahahaha, I’m dying laughing over here!!! Totally know what you mean. Hope the movie night out with your hubby is/was fun! The weather finally cooled down a bit so I made some delicious chili topped with some delicious cheese and dipped into with some delicious chips. This made me happy. My tomato plant growing out of the compost pile is COVERED with green grape tomatoes that just may get ripe before a frost.This makes me happy. Is that your son in the picture with those speakers? I had to laugh at the look on his face! 1) Our neighbor is going to build an outdoor shelter for our horse and said we have enough second hand lumber to use for most of it, he’ll only need a small load of 2x4s to finish it off. 2) I stopped this morning to p/u oatmeal, blueberries and coffee creamer to keep here at the office and decided to buy a Lean Cuisine for lunch. It was shrimp linguini and hit the spot. 3) A co-worker invited me to his reception coming up next month (they were married in Vegas and their families decided to have a reception back here). Thankfully they had registered on Amazon, so I used my Prime account to order them a gift. Since I chose the USPS method of delivery, instead of two day, I received Prime points I can save for later. 4) I’m going to a Women’s in Tech Cyber-Security conference tomorrow in the city. The tickets were $30, since it includes a luncheon – however, that cost is tax-deductible since it’s work related and my co-worker said she’d drive. We receive training/education points, also. I’m certain there’ll be plenty of swag to choose from. Any I can’t use, I always donate to our local shelter. 5) Friday is jean day at work and we usually wear our OU Football t-shirts. Since I received a free OU t-shirt when I donated blood last Monday I can pair that with my jeans. Gotta love FREE! 1- my company has changed our dress code to casual every day, frugal in that I have lost weight and my fall wardrobe is too big so now I can just focus on casual pants. 2- the heat wave was slated to end today so I turned the AC off last night. I love fresh air to sleep. 3- used up a free product coupon just before expiration. 4-adding more meatless meals to the rotation and so far no complaints. 5-loving my audiobooks free from the library for my commute. It also seems a luxury. BTW, we also refer to our vehicles by make, we have one little car and a midsize SUV and the trip length determines what we are driving. Two tall teen boys do not fit into dads little car on long trips. I love reading everyone’s FFT. Sometimes my frugalness makes me feel like an alien in my everyday world, but I am not alone. Here are my most recent attempts. 1) I am eating leftovers for dinner–Cuban black beans and rice with a side salad. I figure dinner cost about $0.35. 2) I am watching the British TV series “Bargain Hunt” on YouTube. Free TV!!!!!! I really need to veg! 3) I went to the Y this evening to run. The sidewalks and roads are not yet debris free following Hurricane Irma. Excercise pays big dividends in the long run, and it’s entertaining. But most of all, it combats stress which is much needed at the moment. Oh and it’s inexpensive. 4) Tomorrow is payday so I reviewed my budget for October. So I spent the morning updating my financial spreadsheets and scheduling my payments using my bank’s bill pay service. I spent the afternoon at my little side hustle. We love Bargain Hunt – it is one of our favourites. Even our teens love to watch it with us. We were recently so upset to find out that David Barby, one of the experts, had passed away a few years ago. We felt like an old friend had died. 1. On Monday I took a 8.5 hour class followed by a 1 hour exam for my new job – they paid both the fee for the class and the hours spent there. Now I just wait for the results. 2. Spending lots of short spurts of time making phone calls and sending emails for said job – keeping careful records of these for billing purposes. 3. We have 2 dinners out this week but both are Happy Hours so can keep costs down and we need to socialize – too bad they fell both in one week. 4. We are having out of town visitors next week and my husband is making all sorts of plans – all that involve big $$ – but I am suggesting that we hold off until they arrive and ask them if they already have plans – maybe they are just sleeping here so why get all stressed out. Plus there are many free/expensive things to do – rent a pontoon for a 1/2 day on a lake – I think not!! 5. Sort of frugal – I am going to DC to babysit for sweet grandbaby while son and daughter in law see Bob Dylan/Mavis Staples concert. I was going to DC at some point this fall and this way they can have a night out and I get a few days with them!!! OK I’m also buying their tickets but it’s Dylan and Mavis Staples!!!! What a concert!!!! I hope they enjoy it. I know you will enjoy the time with the baby. * I have been really good at avoiding personal restaurants outings this month. * Waited until the end of the season to buy needed patio chairs. Got them at half price. * Can’t wear bras with metal wires anymore. Instead of buying new ones I just took the wires out of my old ones. It works. I AM using the term “2004 Echo” as a status symbol, because…. I mean… 2004 Echo, wout! Wout! Ok, sorry, I had to insert some irony here! I haven’t posted in a while because it seems challenging to come up with my FFT lately. 1) Drinking free whole milk in my coffee that the last renters left behind. Delicious! I have discovered that I prefer whole milk to half and half (left by previous renters). Usually it is 1% around here. 2) Dinner last night was Sloppy Joes from The 6 O’Clock Scramble with markdown beef, home grown shredded zucchini and carrot, bargain tomato sauce and buns from the bakery outlet. 3) Found organic blueberries at Costco at a reasonable price for our daily smoothies. Have been using our garden kale in the smoothies as well, which makes me seem more on trend then I actually am. Just trying to use up the abundant kale! 4) Continuing to clean our short term rental myself. Bike season ends around Columbus Day. I was grousing about it last week while vacuuming and then reminded myself that the income we generate from the rental (my cleaning included) allows us to live here in the place I love most. And that makes it more than worthwhile. 5) In light of all the natural disasters that are wrecking havoc on peoples lives, homes, and employment, I am continuing to cultivate an attitude of gratitude and giving to disaster relief as much as possible. One of my favorite quotes is “To have more, desire less”. I’m totally stealing that quote.